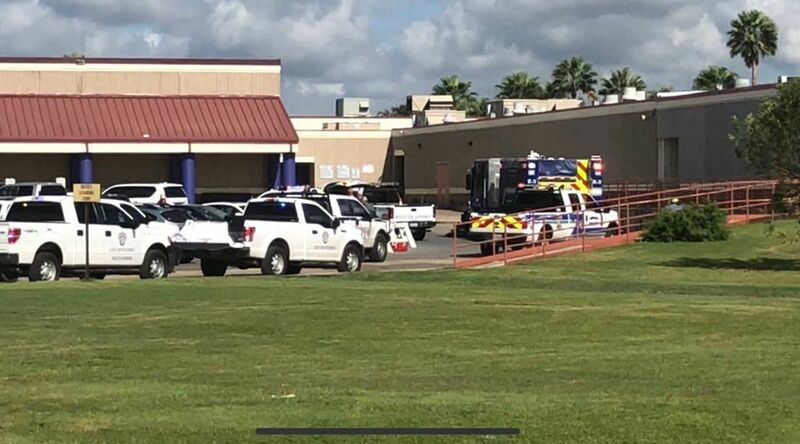 Weslaco Fire Department and area emergency responders investigated reports of gas-like odor at Weslaco High School early Friday. The report prompted a campus-wide evacuation but no traces of gas were found. No traces of natural or chemical gas were found at Weslaco High School following an investigation into a gas-like odor that caused a campus-wide evacuation early Friday. Fire Chief Antonio Lopez said no traces of chemical or natural gas were found, but the odor that prompted the transport of several students to the hospital was caused by sewage traps releasing the odors from several sinks in chemistry and biology labs. The Weslaco Fire Department was notified of a potential gas leak at the school at around 9 a.m., Lopez said. The report stated there was a strong gas-like odor coming from one of the science wings of the campus. The fire department along with its emergency medical services, city code enforcement, fire marshal’s office, police department and the company Chemical Response and Remediation Contractors, responded to the scene throughout. Two people including one student were initially taken to the hospital for nausea-related issues. Responders also identified and evaluated 31 individuals at the scene who were also in the affected area, out of which 10 were later transported to the hospital for further evaluation — nine students and one teacher. All individuals were released the same day, according to school district officials. Parents were notified of the evacuation early Friday and given the opportunity to pick up their students at the Saldivar Gym. Students where also provided transportation at around 11:15 a.m.
“Students and staff safety are a top priority for Weslaco ISD, parents will be updated through social media, email and phone calls,” stated a school district press release. Students are still expected to attend SAT College Entrance Exams today, but classes are not scheduled for Monday due to staff development. But those who might have left items behind due to the evacuation will be allowed to do so on Monday. After several assessments by all parties involved, responders identified the malfunctioning sewage traps in lab sinks as the issue. The strong sewage odor explains the nausea, lightheadedness and other symptoms voiced by those present, Lopez said, and the district took all necessary precautions needed to take care of the issue.